"During marketing and corporate events, we do live streaming via YouTube from events and display that to all staff". South African Publishers. Repeat Signage has multiple editions. These are many common features in all the software editions. 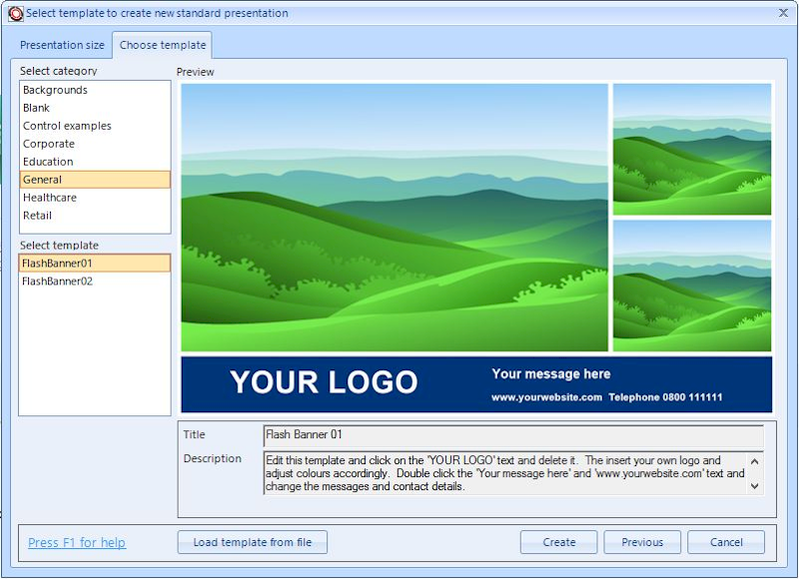 Designing of presentations is made in a similar way to using a design package for images. You insert pictures, videos, PDF files, text, shapes, website pages, etc, and then move and resize them the same as you are used to in most software applications. You haven't got the constraints of a fixed template which is prevalent in many digital signage packages. The aim of the designers of Repeat Signage was to produce a package that was simple enough for school children to use, but powerful enough for professionals. Anyone with good computer skills should be able to create and play a basic presentation in 10 minutes without training. The more advanced features of the software require some studying. Repeat Signage has a context-sensitive help system which means that appropriate help is available whenever you press the F1 key on your keyboard. For example, on the designer screen, pressing F1 will give you information on adding, resizing, moving and deleting all the types of controls (text, PDF, pictures, movies, etc). Repeat Signage - So simple to use, even a 10-year-old can do it. We threw out a challenge to school children to design a presentation for their reception area screen. Thurlestone Primary School in Devon took up the challenge as their IT teacher selected a group of Year 5/6 students for the project. They included sports day videos, artwork, events and even created RSS feeds for school announcements. The Corporate and Media Wall editions support databases connectivity in most controls. See Displaying database information in Repeat Signage. this means you can chose exactly which slides from a PowerPoint you would like to display. The Flash banner control and Picture control both support play lists so you can display all or some of the slides from PowerPoint files. PDF files, pictures, PowerPoint files, Excel spreadsheets, Word documents, etc, can all be displays with these picture based touch screen controls. All of these options are also available in non-touch screen presentations, but without the previous and next arrow buttons. 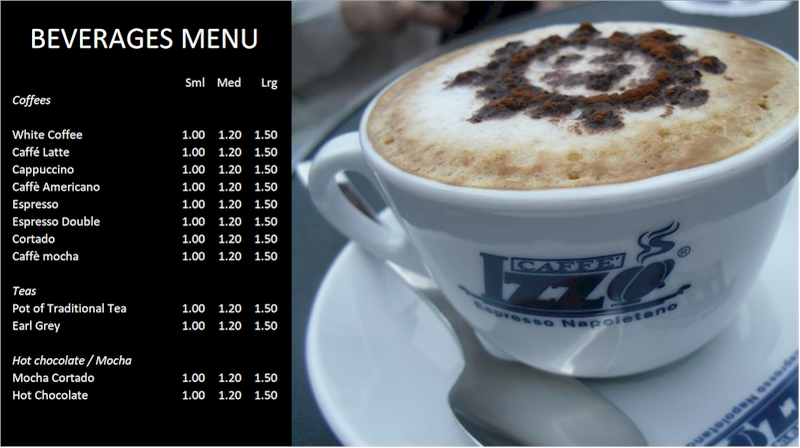 The new Spreadsheet controlis available in all editions of Repeat Signage. There is a built-in spreadsheet editor so you can add spreadsheets within presentations. Spreadsheets can also be displayed from network drives so that you change the spreadsheet and Repeat Signage can then update the screen in real time. We have added a spreadsheet creator/editor to the free tools menu on the main Repeat Signage screen. 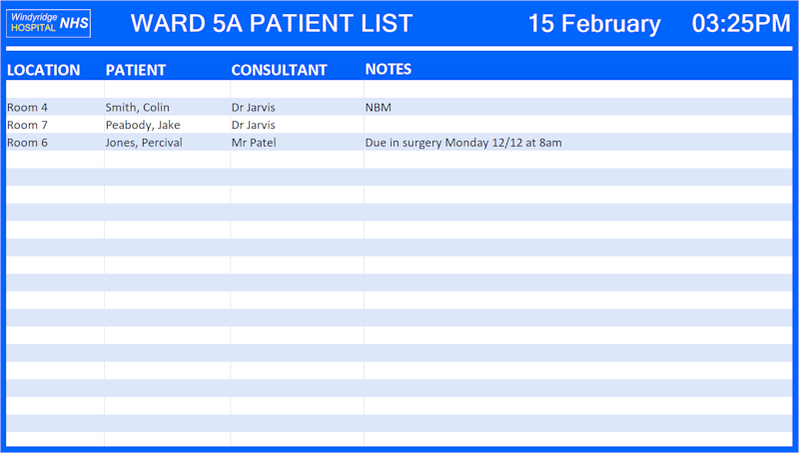 Spreadsheets are also available in the Repeat Pictures system where they are ideal for adding grids and even graphs to your picture files. 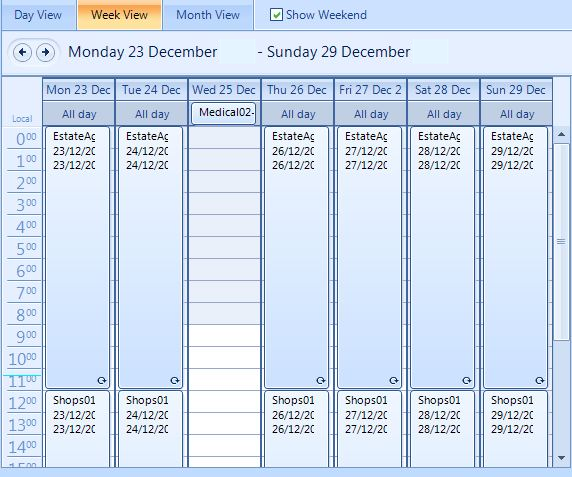 See Spreadsheet control for more information. The Flash banner control to display pictures with text over the top and gives you the ability to have transitions between pictures. There are currently 50 transition effects that you can use. For each picture you can also optionally specify a title and description to go with it. This can be useful when displaying items for sale. For example, in an estate agents window a selection of houses can be shown with a title such as '100,000 Boston' and a description such as '4 bedroom terraced house with large garden'. The above images show text that can optionally be added to pictures in the playlist. The first just has a title and then second has a title and description. The font size, font colour and background colour can be specified for both the title and description. The positioning of the text can also be adjusted. The Flash clock control gives you 10 customisation professionally designed Flash clocks (Note - Only two are available in the Standalone edition). You can specify time zones and background colours for each clock. 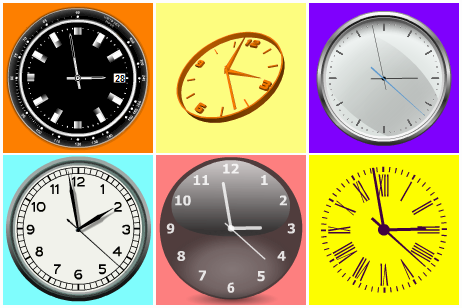 With many clocks you can also change the face and text colours. The are two different Flash RSS control types. The first allows scrolling, rotating and even bouncing text. The second has the news ticker type effect you see on many websites and television channels. You can also create your own RSS news feeds free of charge at RepeatServer.com. 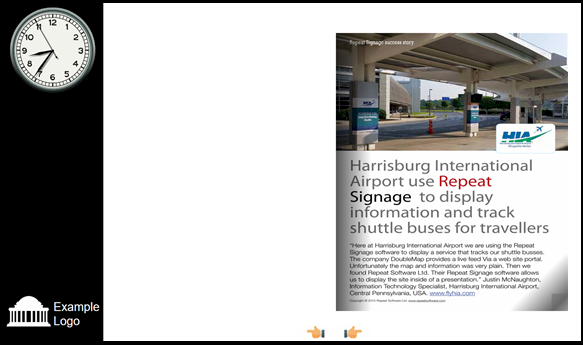 This free service integrates with Repeat Signage so that you can create news feeds and easily use them with Repeat Signage presentations. You can log onto RepeatServer.com from anywhere in the world, using any Internet connected device, and update these. Or, just update from within Repeat Signage. 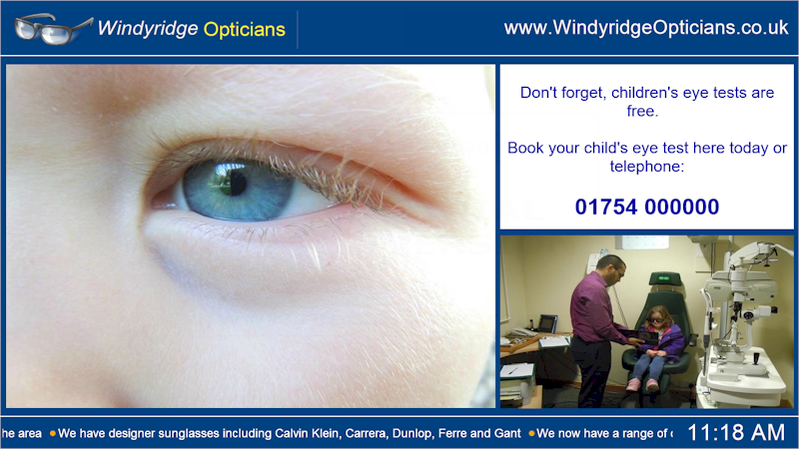 Play lists can be uploaded to your website or a free RepeatServer.com account along with your presentations. Remote Repeat Signage player computers can point at your play list. When you change your play list, then the player computers download the new version to facilitate remote updating. See our Play list screen help page. Design and play presentations in either landscape or portrait orientation. See our landscape and portrait help page. Repeat Signage Media Wall edition supports up to 4 monitors. Many new graphics cards in computers have connections for two monitors. Repeat Signage allows you to display information across multiples screens, or play different presentations on each screen. You only need 1 Repeat Signage Media Wall licence for a computer with 2-4 monitors attached to a single PC. 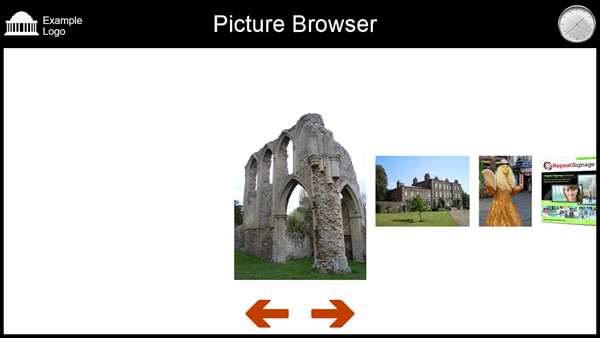 When you come to play either a play list or a presentation, then you are prompted (see above) asking which screen or screens you want to display on. In the example above, screen 1 is ticked but if you designed a presentation that spanned both screens you can tick both screens instead. 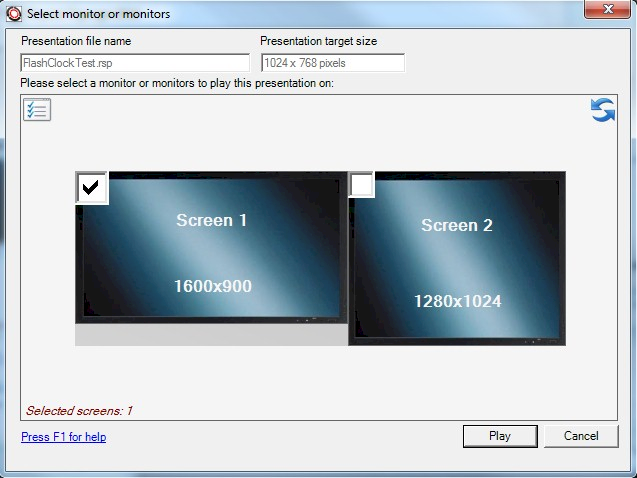 You can also set presentations to start with Windows and on multiple monitor systems then you can select which screens to play presentations or play lists on and whether or not presentations span monitors. 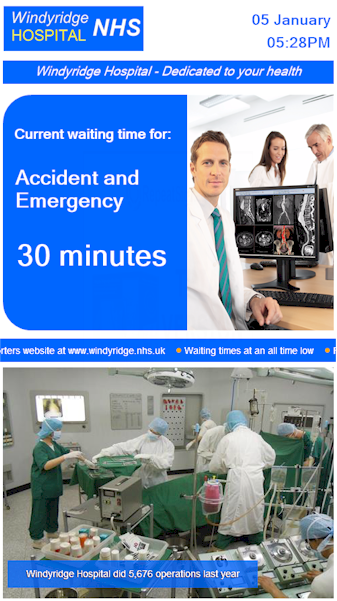 You could have text file or an image adverting a special offer. If this is placed on a network drive (or on an Internet website or RepeatServer.com in the Standard and above editions) then Repeat Signage can monitor this file for changes whilst playing. If you change the text in the file or update the image to a new special offer, then that text can be automatically played. If the file is on a network drive, then it can be updated from any computer on the network (with appropriate access levels). With Repeat Signage V4, your free RepeatServer.com account is integrated into Repeat Signage so that you can select RepeatServer.com items to insert into presentations and even play presentations and play lists directly from RepeatServer.com. In the Repeat Signage system settings, you can choose to monitor playing presentations. Playing a presentation from a network drive allows other network users (with permission) to update it and then the player automatically reloads and plays the new version. The Standard and above editions also allows the use of play lists of presentations so that you can point players at play lists on Internet websites and they are automatically downloaded and played when changed. Also see Using Repeat Signage with Dropbox which gives details of how to remotely update presentations and content files via Dropbox.com. 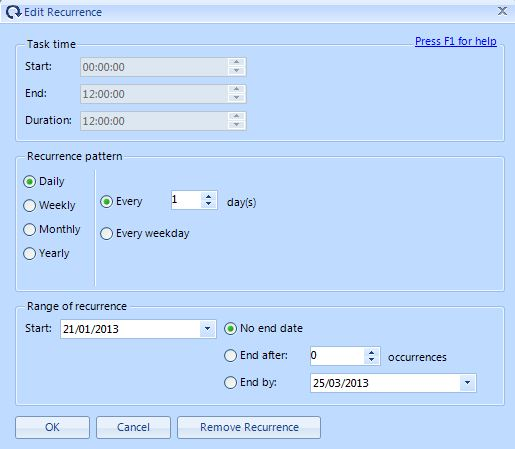 Take a look at the PowerPoint presentation scheduler control help page on how to schedule presentations from within a Repeat Signage presentation, so that you can mix PowerPoint and Repeat Signage. Microsoft PowerPoint files can also be converted to videos. 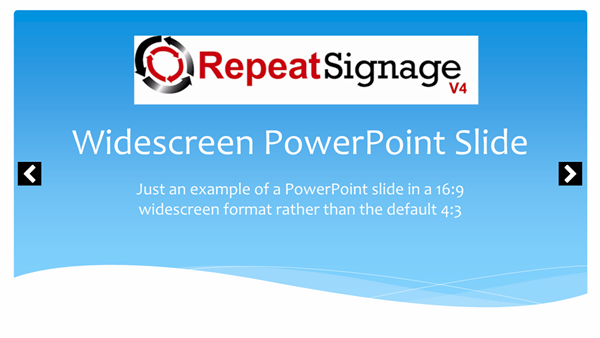 See the Using Microsoft PowerPoint presentations in Repeat Signage help page for more information. 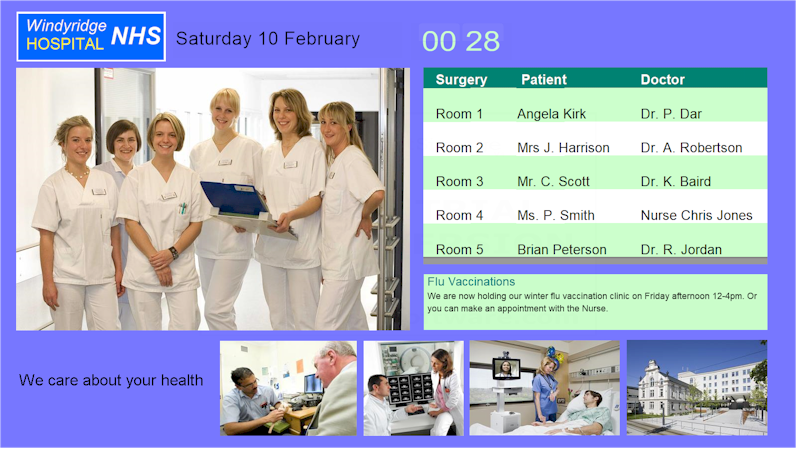 You can now create touch screen digital signage presentations in Repeat Signage. Please see Touch screen presentations overview for more information. 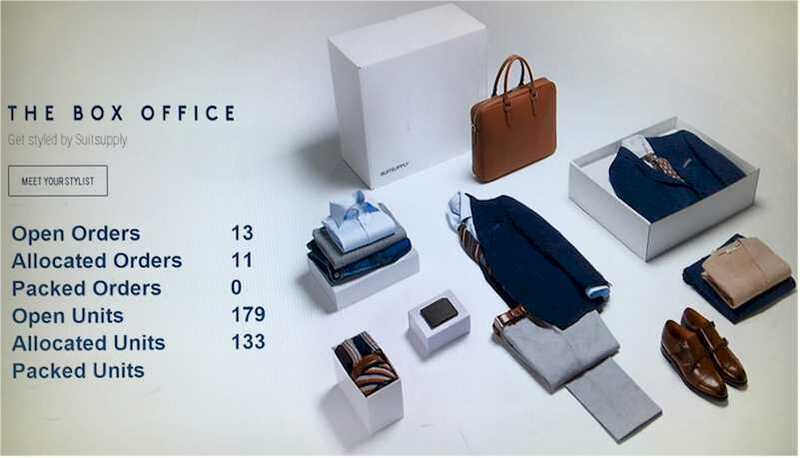 We have a number of sample presentations online to help you get started. 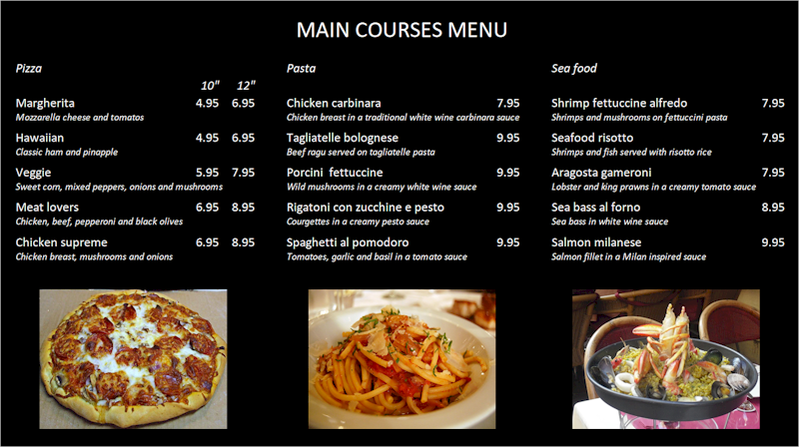 See Sample presentations. If you install a free PDF or picture printer, that installs as a virtual printer under Windows, then you can print from your applications (Word, Excel, Visio, etc) to either PDF or picture files. Repeat Signage presentations using these files can monitor them for changes as they are playing, and automatically update the playing presentations with the new versions. You can specify to keep your playing presentations on top of all other Windows programs and keep it there actively. The is a player option in the Repeat Signage system settings. The first picture above is the original image. 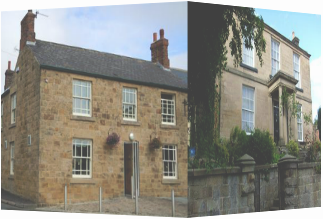 The second picture shows a tall and thin image and the left and right sides of the image have been cropped (removed) rather than stretching the image. The third image is long and thin and the top and bottom of the image has been automatically cropped. The above images are cropped using our AUTOCROP CENTRE setting of our picture control. 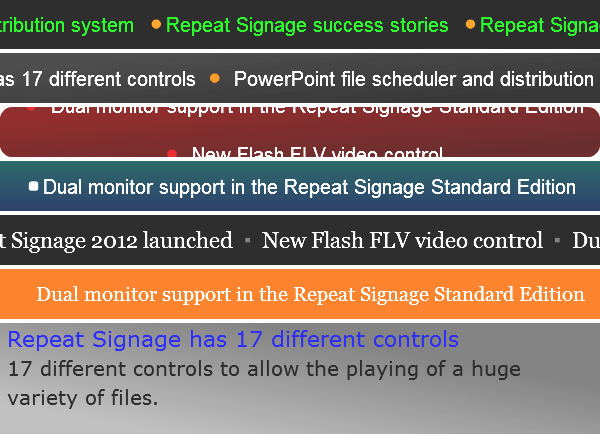 Repeat Signage has it's own built in RSS feed manager for creating RSS feed files that you can use on network drives. See RSS feeds for more information on what RSS feeds are. You can create and host RSS feeds online using our free service RepeatServer.com and this can be used with the Standalone, Standard and above editions. Content files such as pictures and videos can be played from within ZIP files which means that transferring updated content over the Internet requires minimum bandwidth and download time. "We are a 3PL logistics company specializing in E-Commerce, wholesale, retail distribution on behalf of our clients. We are using Repeat Signage software to display the KPI dashboard to show the pending status of all orders and in what stage they are in so our employees and top management are always on top of what is going on and can easily react to any delays or other related issues. Igor Pestrikov, MODAEXPRESS USA, Secaucus, New Jersey, United States.